This popular dish is Gluten Free, Soy Free, and Nut Free. Prepare the Veggies: Rinse all the veggies and pat dry. Cut the onions, tomatoes, bell peppers, and chiles (based on spice preference) into small cubes. Don't forget to remove all membranes and seeds from the bell peppers and chiles! Place the oil into a large skillet and put on medium heat on the stove. Add the onions, tomatoes, bell peppers and chiles and sauté them for about 5 to 7 minutes or until caramelized. Once the vegetables have been caramelized start adding the machaca to the mix. Continue stirring and mixing the machaca with the vegetables until there is a a bit of crispiness to the machaca. While the machaca is cooking, go ahead and add 4 corn tortillas to a large pan or comal (if you have one) and heat up the tortillas (about 2 minutes per side). Then add your favorite type of cheese (queso fresco is always good, though muenster is a great substitute). 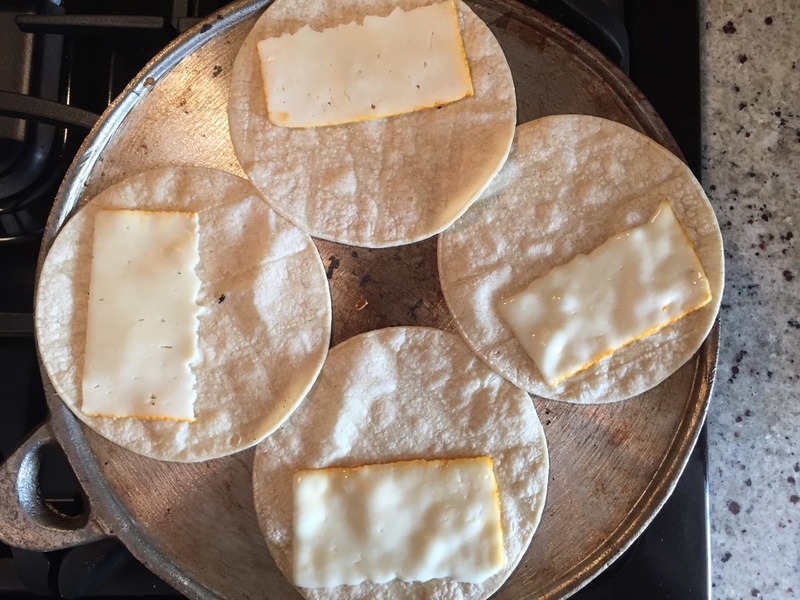 Wait until the cheese is slightly melted and then flip the tortilla closed into a quesadilla. In a separate pan, drizzle some oil or use a little bit of butter to coat the bottom of the pan. Then crack two eggs and cover the pan for a few minutes. Depending on how you enjoy your eggs, you may want to leave them cooking longer + flip them over if you like your eggs well done. Once all of your ingredients are prepared it's time to plate! I like using a small ramekin to help give me shape to the machaca. Spoon the machaca into a ramekin and once it's full, flip it over on a plate. Place the egg and two quesadillas next to the machaca and get ready to serve. Sit back and enjoy your wonderful + easy meal. Our favorite way to eat this wonderful dish is to make tacos out of the machaca. Open up the tortilla and put the egg and machaca inside. A very wise woman once said that the best taco's are the ones you can't close. - Enjoy! Derek and Romaine from SiriusXM Radio In Mazatlan!